Is the Kindle Getting a Color Screen? Amazon may have colorful plans for the e-ink members of its Kindle family. According to a Digitimes report, electrophoretic display (EPD) maker E Ink Holdings has reportedly received an order from Amazon to build 6-inch color e-reader models. The brief report, which cites the Chinese-language Economic Daily News as its source, says shipments of the touched-enabled, color e-readers will begin in March, and are expected to top three million units per month. The addition of a color e-ink model would add another dimension to the popular Kindle, which excels as an ebook reader but isn't equipped to compete with pricey, more powerful tablets. 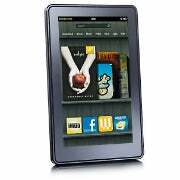 Its paper-like, non-backlit display is ideal for outdoor use, unlike color LCDs--including Amazon's own Kindle Fire--which are typically too reflective for use in bright sunlight. It's unlikely that a color e-ink Kindle would compete directly with the Kindle Fire, which features a 7-inch color LCD. E-paper displays have very low refresh rates, making them a poor choice for tablet-style applications like video streaming. A color e-ink display could widen the Kindle's appeal, however, by making the eReader more suitable for a variety of books and periodicals, including color children's titles, comic books, and textbooks with color illustrations. A color e-ink screen also might be a good match for Amazon's 9.7-inch Kindle DX, a larger (and largely forgotten) eReader that has failed to find a niche in either the consumer or education markets.